“A MOVE to impose additional fees on patients to visit their GP could limit access for the disadvantaged, the Australian Medical Association (AMA) believes. News Corp Australia newspapers have reported that a Commission of Audit into government services has listed co-payments as an option for the federal government to consider. Co-payments would see patients fork out a fee for bulk-billed visits to the GP. A research paper compiled by Prime Minister Tony Abbott’s former health adviser suggests a co-payment could reduce GP visit numbers, the report says. 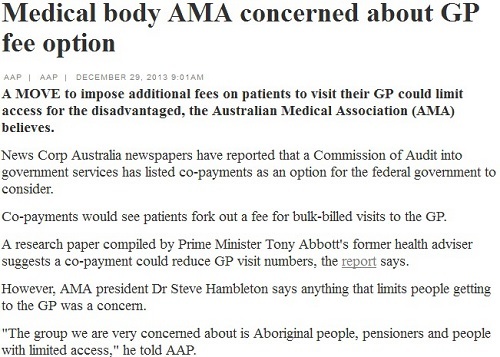 However, AMA president Dr Steve Hambleton says anything that limits people getting to the GP was a concern. Healthcare professionals in Melbourne, Victoria, have reason to be concerned. Australia’s cultural capital has a robust medical industry, which suits various disciplines. Healthcare institutions include the Royal Victorian Eye and Ear Hospital; St Vincent’s Private Hospital; and the Royal Women’s Hospital—plus a number of cancer research centres. Whether this proposal is approved by the federal government or not, medical practitioners should continue to rely on the services of trusted medical accountants in Melbourne, like the chartered accountants of MEDIQ Financial. These chartered accountants can meet their clients’ accounting and bookkeeping needs; expense claims and controls; patient and Medicare billing; and government/employer record keeping. They can also assist their clients with their PAYG, BAS, GST, and Superannuation contributions. Healthcare in Australia, for the most part, is covered under Medicare, plus any private health insurance options healthcare professionals and their patients may seek. However, the proposal may warrant further scrutiny for healthcare professionals and their accounting specialists. A closer study indicates that a $5 fee will be set on bulk-billed consultations with a GP. At the same time, families will get bulk-billed by their GP only after 12 free visits a year. The Barnes paper states that the reduced GP visits as a result of implementing co-payments may save the government around $750 million in four years. If implemented, such a development would factor into the strategic plans for the future development of any medical practice. The proposal, which is an offshoot of another plan presented in another administration approximately 20 years ago, is being touted to augment a recent insurance premium hike. Skilled medical accountants can assist their clients with all their accounting and bookkeeping needs. This will enable medical professionals to focus on their practice.